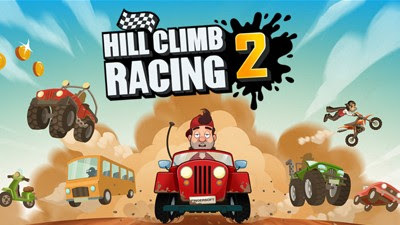 Here's some quick FAQs, tips, tricks, and strategy guide for the action and arcade racing game - Hill Climb Racing 2, presented by Fingersoft. Available to download on the App Store and Google Play. - Race and win cups until you are able to fill up all 3 prize reward slots. - If available, open them for free by watching ad videos. - Grab 1st place to earn Medals for unlocking Red Prizes. - Wait for the cool-down timer to open Blue Prizes. - Increase League Lvl to unlock more vehicles. Aim for 1st or 2nd place to increase progress. - Unlock and buy new vehicles to make your progress easier, no need to upgrade anything. Start upgrading once you are able to unlock all end game tier vehicles, and only if needed (if you are constantly getting 3rd or 4th place from cups). - Once the countdown says "GO", try to start accelerating while the meter pointer is within the "Green Area" of your RPM meter. It doesn't have a noticeable effect but it might in the future. 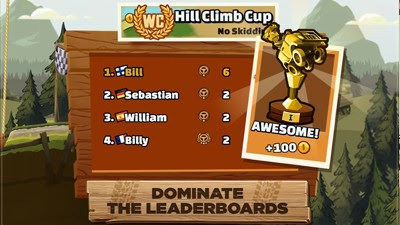 - When playing Cups, you need speed and control, so reduce getting "Air Time" and land as soon as possible after climbing a hill to quickly pick up your speed again. - Always land parallel to the ground, to quickly recover and accelerate faster. - If you can still grab 1st place overall, you will also be given some bonus Coins. - Unlock and use the next tier of vehicle to increase your chances of winning. 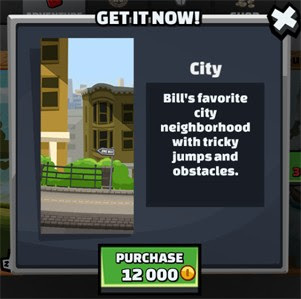 - Earn your Coins from the start and use it to unlock the City Stage under Adventure Mode. - This is your main farming area for Coins early game. Easy to play and drops a lot of Coins as you go farther. - Be careful though, there are areas where you need to slow down or go faster. Take your time, and learn the curves. - The un-upgraded (all Lvl 1) Scooter or Super Jeep should be able to go beyond 2000m. - When playing Adventure Mode, don't focus on Speed (tune down if needed), concentrate on how to conquer the obstacles and get the next gas item. - If you are having trouble because of some obstacles that can break your driver's neck, use the Super Jeep to get protection against it. - Air Time will also generate some Coins, so try to control and keep your vehicle in air for as long as possible. - Other tricks like "Wheelies" and "Flips" will also generate Coins. - If available, watch ad videos for free upgrades! - If you are having trouble winning from here on, you might want to consider leveling your current vehicle (I suggest upgrading your Motocross at this point). - I usually level up all upgrades evenly to make them balanced, or at least all other upgrades should be equal to or higher than your Engine's Lvl. - Level them all up until you can win 1st or 2nd place from Cups again (All upgrades at Lvl 2 should be enough, increase if needed). - Your upgraded Motocross should do fine around here, but keep farming Coins for the Sports Car. - Evenly upgrade your Sports Car and any vehicle you prefer for Cups. 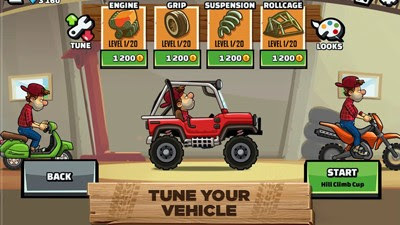 - Super Jeep: can protect your driver's head, useful for certain areas and for farming Coins from the adventure mode. Good overall vehicle to have and upgrade. - Motocross: great for areas with lots of hills, water ponds, and other tricky obstacles, great for Cups. - Sports Car: Awesome speed, control and stability, upgrade for Cups. - Newer Vehicles: If you want to use them for Cups, upgrade them first. How Much is the Motocross? - 20,000 Coins to unlock. How Much is the Sports Car? - 80,000 Coins to unlock. How Much is the Monster Truck? - 40,000 Coins to unlock. 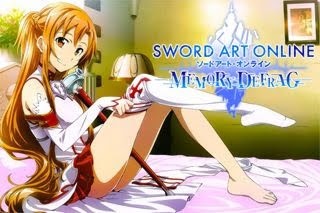 - This is our first guide for this game, related links will be added soon.